Now that the weather has cooled considerably, you’re inclined to roll out your favorite blanket, get comfortable on the couch, and dive straight into an online shopping session. First up on your search? Tommy Hilfiger. From classic peacoats to textured sweaters and tweed skirts, check out the warm layering pieces that are essential to your winter shopping list. Scroll down to shop 13 cold-weather items from the Tommy Hilfiger Collection. 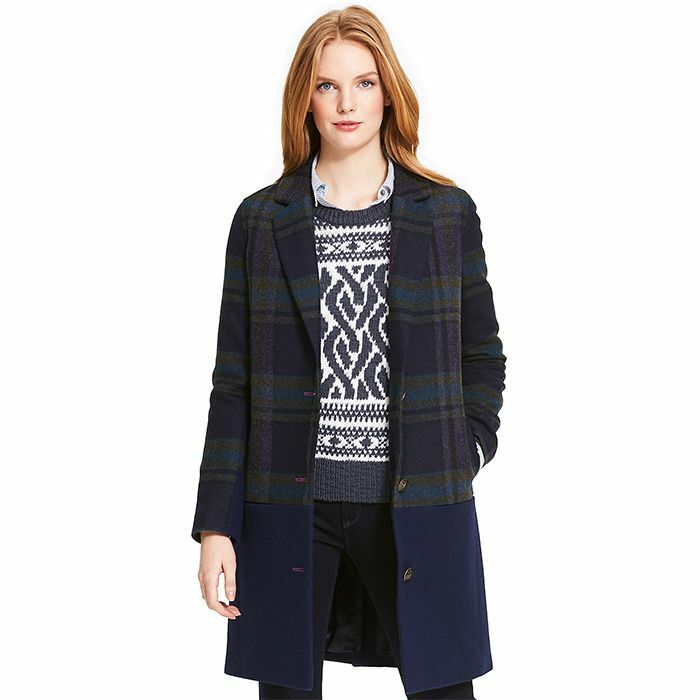 Layer this versatile plaid coat over your favorite Fair Isle sweater. A shearling collar adds a cozy finish to this classic peacoat. This oversized plaid coat instantly punches up a basic sweater and jeans. Update this A-line skirt with a tucked-in denim shirt for a casual look, or a lace top for a night out. Pull off a polished look by layering this knit sweater over a crisp button-down. Up your off-duty outfit game with a sporty-chic baseball jacket. This pleated skirt is flattering on most figures, and lends a festive touch to your look. When is a flannel shirt not a winter must-have? It’s practically a neutral. Anchor bulky layers with a pair of sleek, skinny jeans. A cropped tuxedo pant will add a tailored touch to your day-to-night look. This mohair turtleneck’s slouchy silhouette makes it a comfortable weekend option. Contrast the boxy silhouette of this cropped jacket with sleek, tailored trousers. This gray peacoat comes with a weathered finish, giving it a vintage, worn-in feel. Shop more cold-weather pieces from Tommy Hilfiger here.